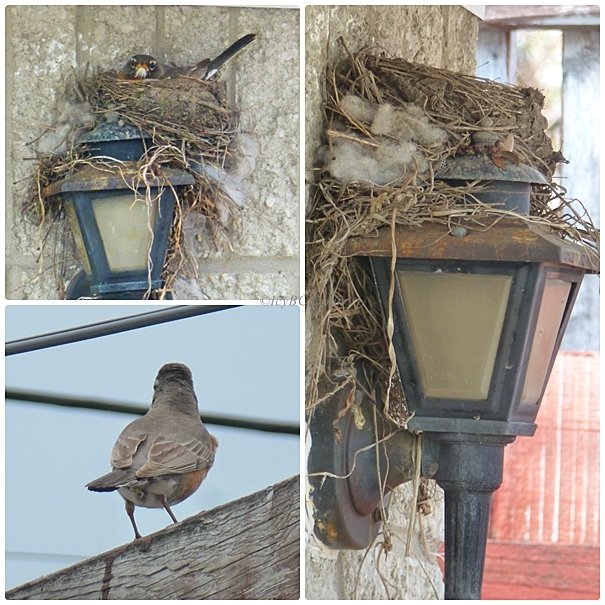 This is another robin's nest at my mom's house, and this spot is in demand every year. The two lights are situated on both sides of the garage, and only one side of it is occupied this year. We were having a gathering on the driveway, in front of the garage, forcing the robin to leave her nest. She wasn't please and contested in a loud mean voice. However, my son stood on the chair and snapped some pictures of eggs without touching anything. Robin's eggs are the most beautiful shade of blue aren't they! Your robins do not appreciates its neighbour. Amazing shade of blue! Hope your even went well and your Momma Robin returns to care for her eggs. Happy Critter Day! good luck to mama robin! Oh Icy the eggs in the nest are priceless. Thanks to you and your son -- and hope Mama Robin recovered her good temper and all is fine in the nest. Love the colour of the Robin's eggs. Not much prettier than Robin Egg Blue. Cute shots of the robin and the blue eggs.. I hope the nesting was a success. I am catching up after being away, thank you for linking up to my critter party.. Have a happy day!